Nothing Stores Ionized Water Like These Vacuum Sealed Stainless Bottles! Our double-walled, food grade/commercial grade, BPA-free, high-quality vacuum sealed stainless bottles are the perfect storage containers for ionized water! Storing ionized water is a challenge! We’ve had customers asking us about ionized water storage for years, and before these vacuum stainless steel water bottles we could only recommend mason jars. Most bottles will not work well to store ionized water, because there needs to be no air bubble to let the anti-oxidants escape into. After years of testing, Alkaline Water Plus can safely say that your pH and ORP will remain at almost fresh-poured levels all day long using these insulated bottles! 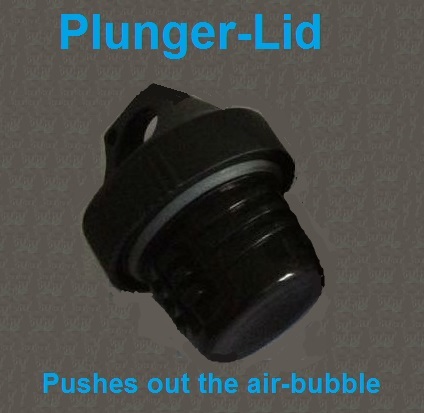 Just fill them to just above the inner "lip", screw on the lid and go! Hours later you can open and drink great, refreshing ionized water! These bottles provide an effective way to carry your ionized water and keep it as good as when you first poured it. They are double-walled. and thermal-insulated. In all of our years of testing we have never found a bottle that stores ionized water as well as our vacuum-sealed stainless bottles. Why do these Vacuum Sealed Stainless Bottles preserve the ionization so well? It has to do with both the high-quality materials and design which won't allow any gasses to escape and the specially-designed lid which doesn't trap air in the bottle. With our wide-mouth design it's perfect for adding ice to your bottled ionized water. You can use these bottles for storing anything hot, cold or neutral for up to 24 hours with very little change in temperature. It is not suggested to use a dishwasher or harsh detergents with these bottles, because you may damage the exterior finish. A gentle, easy wash with mild temperature water is all you will ever need. See below for a link to lab results of storing ionized water for several days in these vacuum stainless bottles. It shows excellent results, with no toxins, whatsoever, getting into the water.